Christmas dinner brings out almost as much food as Thanksgiving. I’ve written about some of my favorite Christmas dinner dishes here. If you plan to make another turkey for yours, here’s a low-fat, low-sodium stuffing/dressing you can make to go with it. This recipe comes from the Food Network site but I’ve modified it to cut the salt even further. The original recipe has 206 mgs of sodium per serving, a cup of it. I’ve subbed in a salt-free bread from Trader Joe’s and a salt-free broth for the chicken broth specified in the original. I also used Smart Balance instead of butter so the fat content is likely lower as well. The original lists 1 gram of fat per serving using butter. Here’s a photo guide, it’s fairly simple to make. 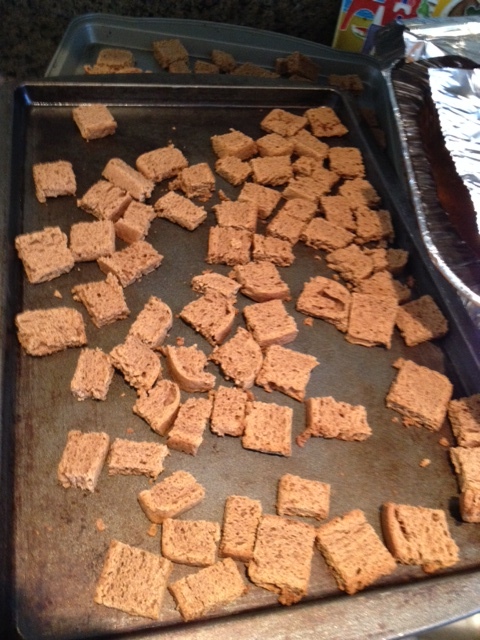 Cut the bread into small cubes and bake briefly to make to crispy. 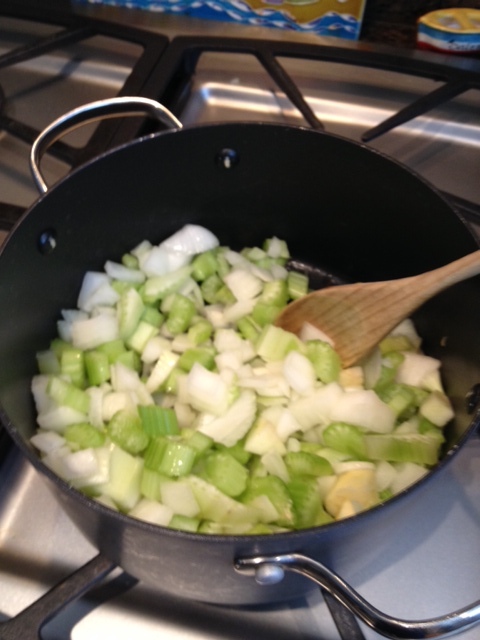 Cut the celery and onions and put in a bowl. 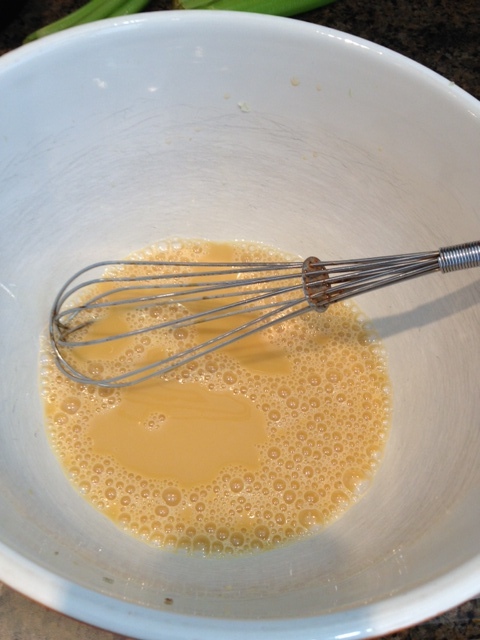 Combine the liquid elements, salt-free broth and egg whites, in a bowl. 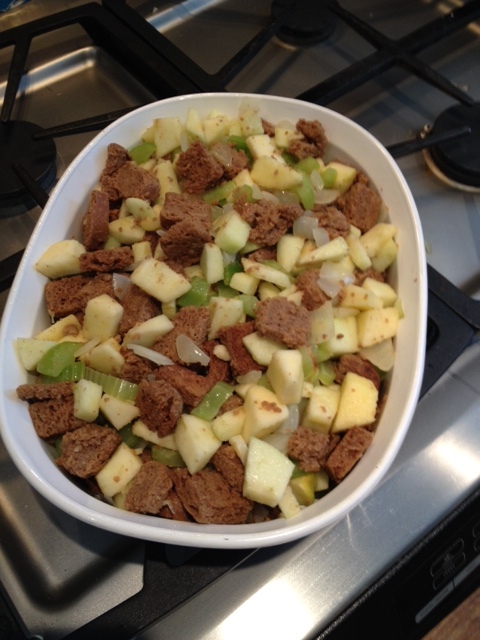 Add apples, parsley and raisins to the liquid mixture, then the bread crumbs, stir, put it all in a baking dish, cover with foil and bake for 20 minutes or so. For exact measurements and directions, click here. Sugar or Fat? Which turns you on more? Why would you say you are providing a recipe and then NOT put it on the page where you discuss it? That doesn’t make any sense.